Racing of the Lido 14 sailboat is governed by the Lido 14 Class Association, a Non-Profit Mutual Benefit Corporation within the State of California. The purpose of the corporation is to promote one-design racing of the Lido 14 Class sloop under uniform rules so that all may do so affordably and fairly. 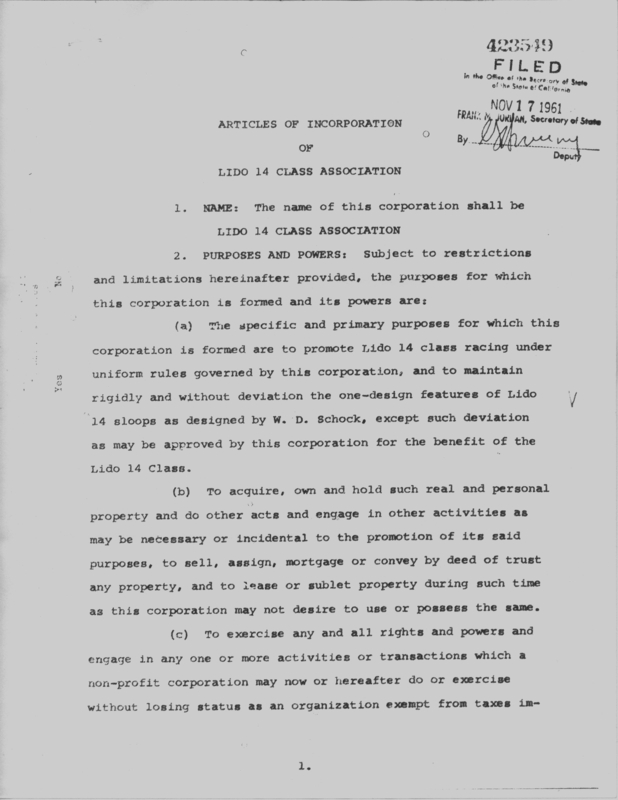 The legal documents governing Association include the Articles of Incorporation and its Bylaws. 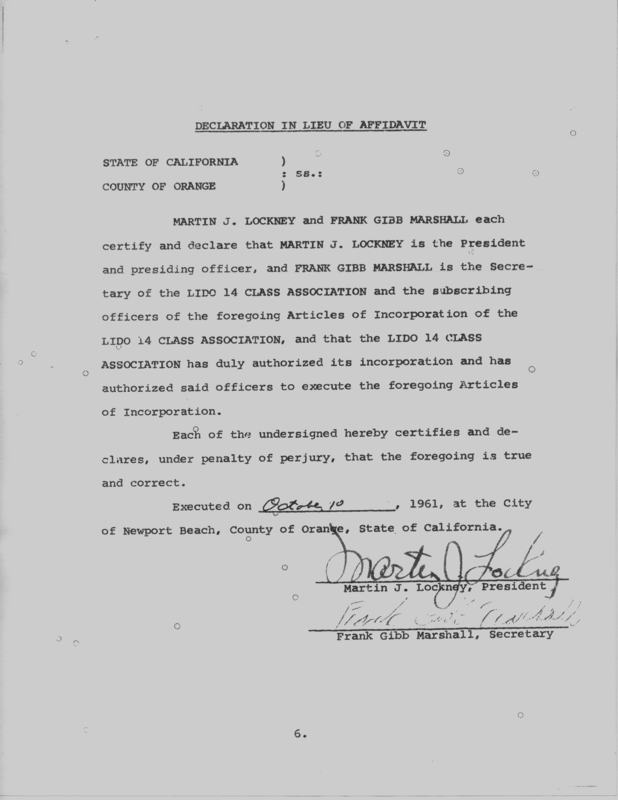 Lido 14 Class Association became a non-profit corporation under the laws of the State of California in 1961. 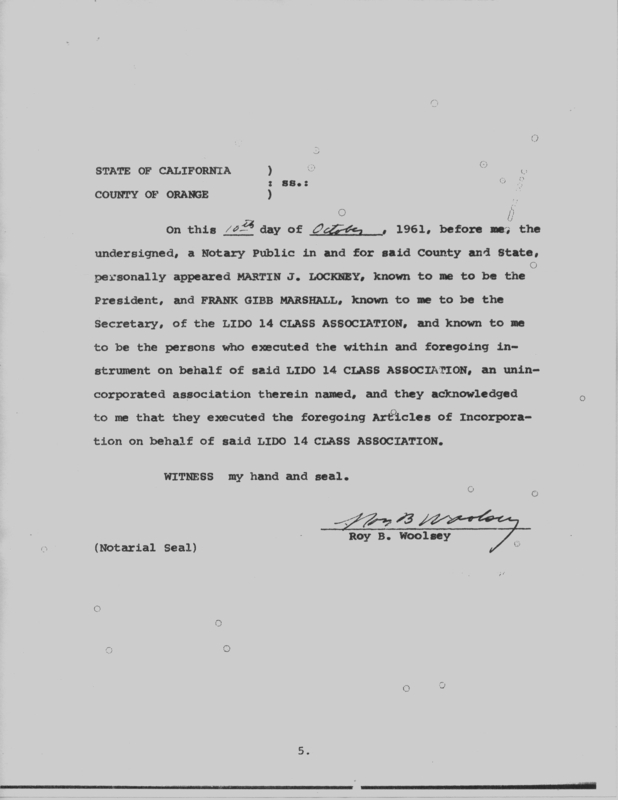 The original Articles of Incorporation are maintained with the California Secretary of State and are available for public review. 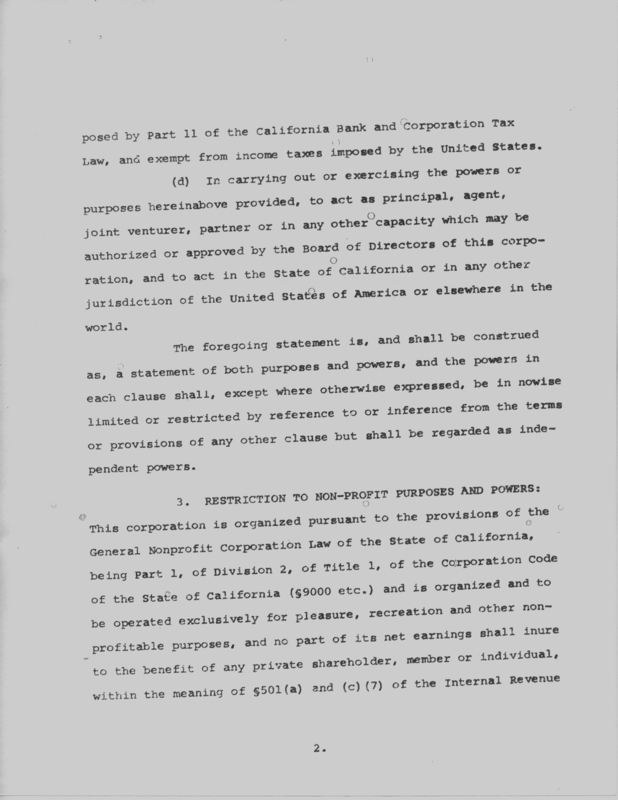 A complimentary copy of the Articles of Incorporation are presented here in the form of scans of the official records on file (as of October 9, 2008) with the Secretary of State. 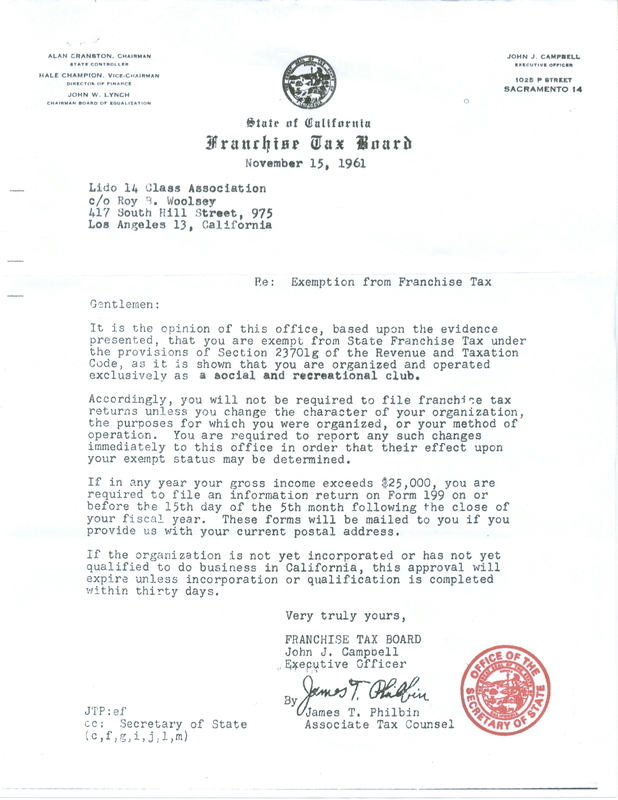 The documents include a cover letter from the Secretary of State bearing her seal, the Articles of Incorporation, affidavits and the like concerning the Association, and a letter from the California Franchise Tax Board regarding the Association's tax status. 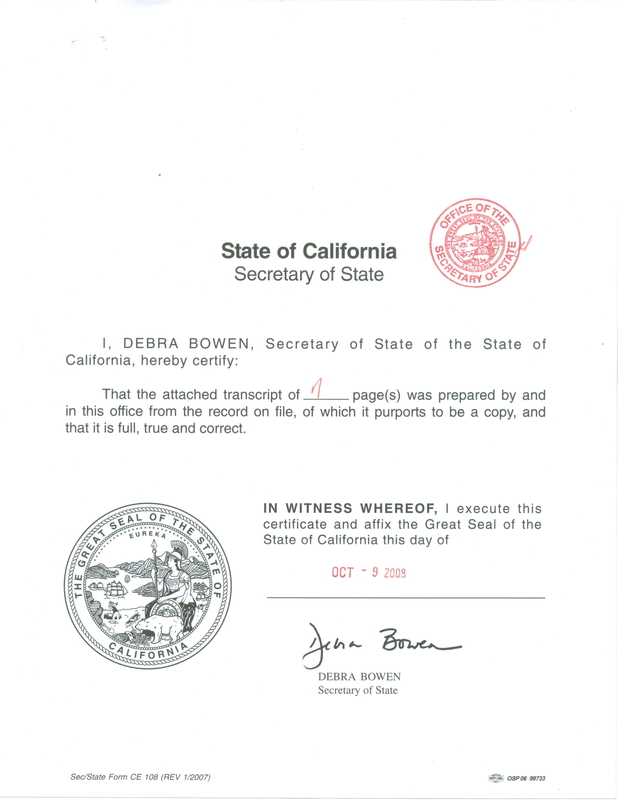 This final document also bears the seal of the Secretary of State - to indicate the end of the official packet of documents held on file by the Secretary of State. 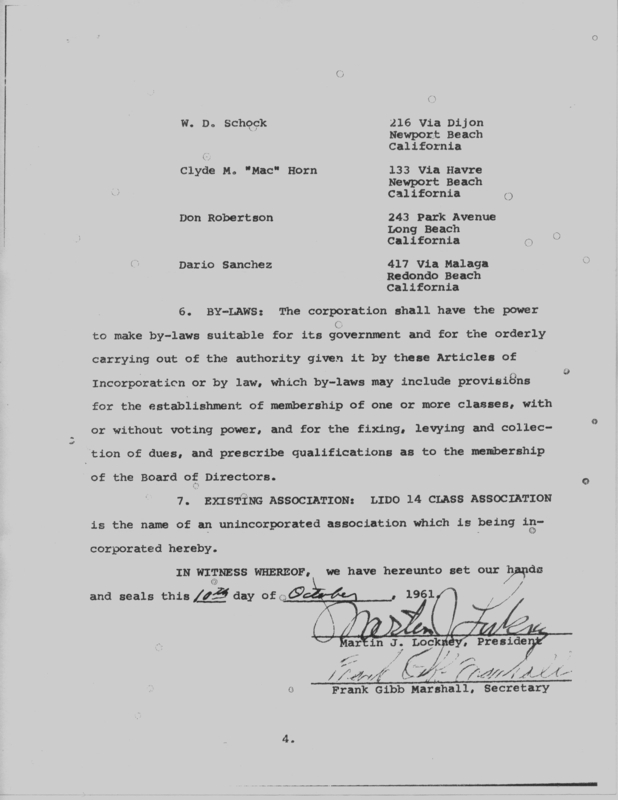 The Articles of Incorporation provide for the making of bylaws suitable for the Association's governance, to establish membership classes, voting powers, fixing of dues, and defining qualifications of the Board of Directors. These bylaws have been regularly published in the Lido 14 Class Association Handbook (provided to members of the Association) and have been amended on numerous occasions using the procedures defined within the bylaws. Amendments require the majority vote of the voting membership so they generally occur at the Association's Annual Meeting, held in conjunction with the annual Class Championships Regatta (aka CCR). 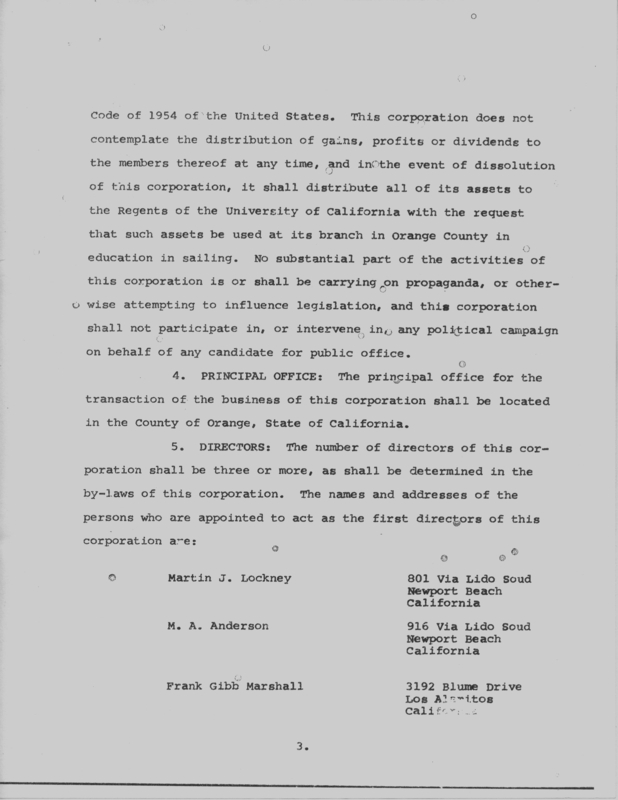 The Approved Changes, which are usually published in conjunction with the Bylaws, are not Bylaws but are separate rules established by the majority consent of the Governing Board, which meets a various times through the year. Though the Bylaws and Approved Changes have been amended in recent years, the Association has not maintained an up to date copy for review by Association Members. For reference, the 2004 Bylaws and Approved Changes are presented here.